Dying and dead Douglas firs in North Albany County Park on Sept. 7. North Albany County Park is a sad sight these days. Dead and dying Douglas firs all over the place. These trees could become a hazard, so Benton County has to cut them down, and for that to be done, the county is closing the park next week. The closure is scheduled Sept. 12-19 and affects the entire park — fields, trails, wooded areas and all facilities including the playground. 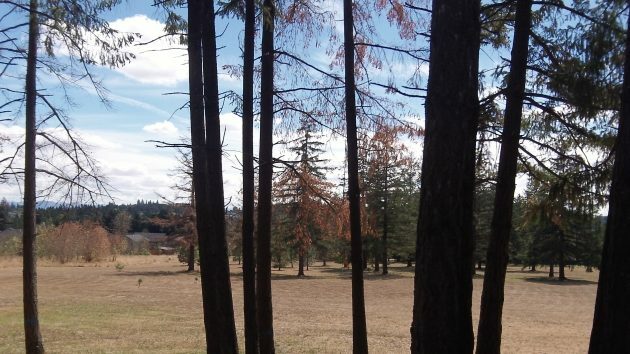 After the park reopens, the removal of hazard trees moves into the nearby 10-acre natural area at the corner of Valley View Drive and Crocker Lane. That property has no public areas yet, but it too will be “closed” Sept 20-26. The dates might change depending on weather and other unforeseen events. At the time of a public meeting at the park in June, the county expected 116 trees would have to be cut down. Jeff Powers, the head of parks and natural areas for the county, told me Thursday that by now the number probably has gone up. A combination of soil conditions, drought and pests is most likely the cause of the die-off. 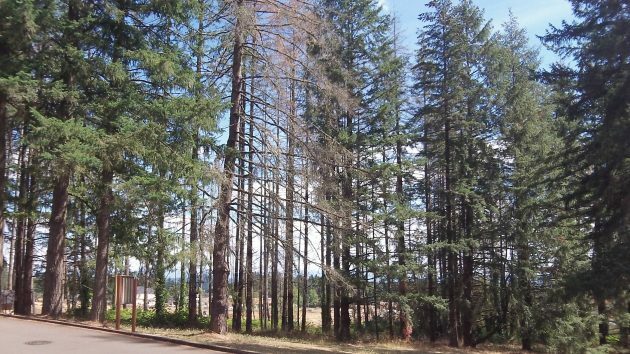 Douglas firs in nearby neighborhoods and other parts of the valley have been dying too, at a seemingly accelerating pace. Other species, birches for example, seem to be affected too. The tree cutting at North Albany Park will be done by R.L. & Sons Logging of Philomath at a cost to the county not to exceed $9,000. Powers hopes that the county gets half that amount or more back when it sells the logs. He can’t be more specific because the logs have not yet been cut, let alone graded. The park will look kind of bare once the logging is done. Nice report HH. I’m not sure about “sad sight these days” though. A “new beginning”? I like that better. Thank you for bringing us this post. Doubt it will be covered elsewhere. Back to the new beginning…. Benton County seems to be putting in an effort for this space now. A good thing!